AmazonAmazon’s books to read in November. Amazon Book’s editorial team has unveiled the new must-reads for November, from fan-favourite authors like Stephen King to stories that are sure to be a hit. Whether you enjoy historical biographies or prefer gripping novels, there’s a book here for every reader. 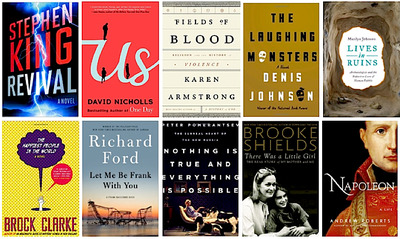 Below are the 11 books you should pick up this month. “A Backpack, A Bear, And Eight Crates Of Vodka” by Lev Golinkin: In this autobiography, Golinkin describes his family’s journey to escape the final decade of the Soviet Union during the late 1980s as well as his trip back as an American man. We follow him as he both comes to terms with his past and the hatred he felt as a Jewish man in the Urkarine and thanks the strangers that made his escape possible. “Fields Of Blood: Religion And The History of Violence” by Karen Armstrong:From the best-selling author of “A History Of God,” “Field Of Blood” explores the connection between violence and a variety of faiths, including Christianity, Islam, Buddhism, Hinduism, Confucianism, Daoism, and Judaism. Armstrong tries to understand if religion truly does lead to violence, as well as if peace among all believers could ever be achieved in our time. “The Happiest People In The World” by Brock Clarke: Danish Cartoonist Jens is forced to relocate after he draws a cartoon of the Prophet and becomes an assassin’s target. After being saved by the CIA, he’s plopped down in a small town in New York state and given a new name, job, and background — but that’s when the story truly takes a turn. “The Laughing Monsters” by Denis Johnson: A mixture of “Heart Of Darkness” and the post-9/11 world, this novel follows Roland Nair as he reunites with his friend Michael Adriko in Sierra Leone. Their friendship is pushed to its limits as the two men and Michael’s gorgeous fiancé travel ever deeper into Western Africa to search for Michael’s lost village. “Let Me Be Frank With You” by Richard Ford: This is the fourth instalment in Ford’s celebrated series on Frank Bascombe (including “The Sportswriter,” “Independence Day,” and “The Lay Of The Land’). Bascombe is now 70 and easing into retirement, but the novel places him in the aftermath of Hurricane Sandy. For fans of the series, Ford is at the height of his game. “Lives In Ruins” by Marilyn Johnson: Johnson interviews the modern Indiana Jones-type archaeologists who travel around the globe finding people, places, and clues that no one else has seen in centuries. They track down the small pieces of history that shape our culture, and reflect on what it means to uncover these stories that have been buried or lost. “Napoleon: A Life” by Andrew Roberts: Napoleon is perhaps the most famous soldier-statesman in history. He is remembered not only for his battles and military mind, but his leadership as well. With thirty-three thousand newly recovered letters that he wrote, Roberts’s biography is an important new volume that illuminates Napoleon’s psyche. “Nothing Is True And Everything Is Possible” by Peter Pomerantsev: This book delves into the modern Russia that emerged when the Soviet Union collapsed in the early 90s. From reality television and big business to Putin as the ring leader of it all, Poverantsev proves why everything you think you know about Russia is wrong. “Revival” by Stephen King: King’s most recent thriller spans five decades and focuses on the rock n’ roll obsessed Jamie Morton and the small town reverend Charles Jacobs. Both men are haunted by tragic pasts and share a secret obsession, so they are naturally drawn together into a partnership as they search for answers — and find terrifying conclusions. “There Was A Little Girl: The Real Story Of My Mother And Me” by Brooke Shields: Actress and model Brooke Shields recounts her relationship with her single mother Teri, a woman who was not only her manager and confidante, but also a struggling alcoholic. Shields shares how Teri influenced her own experience as a mother and the pair’s mother-daughter relationship. “Us” by David Nicholls: Douglas Petersen is thrown for a loop when his wife Connie asks for a divorce. It couldn’t come at a worse time as the couple and their 17-year-old son Albie are off on an adventure across Europe. The believable family relationships and complicated ending will keep readers invested in the Petersen clan.